Butters very quickly grew to know and love her family (although it’s impossible that she could love them as much as they loved her!). The next adventure was to explore her new home. Butters’ mommy lived in an apartment on the second floor of an old brick schoolhouse in Suburbia. Once you entered the apartment, though, it didn’t look like a schoolhouse at all. 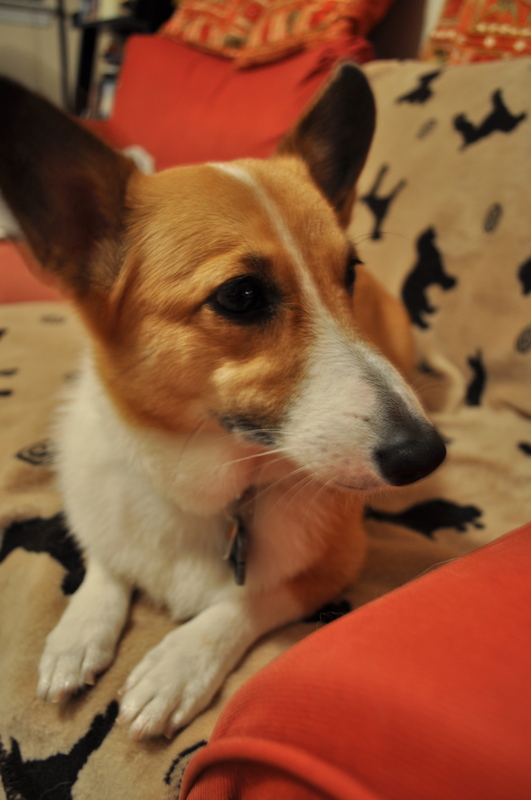 Butters roamed through the different rooms and explored. At first, Mommy would leave her in the crate during the day while she was at work, so that Butters could grow accustomed to her new surroundings. 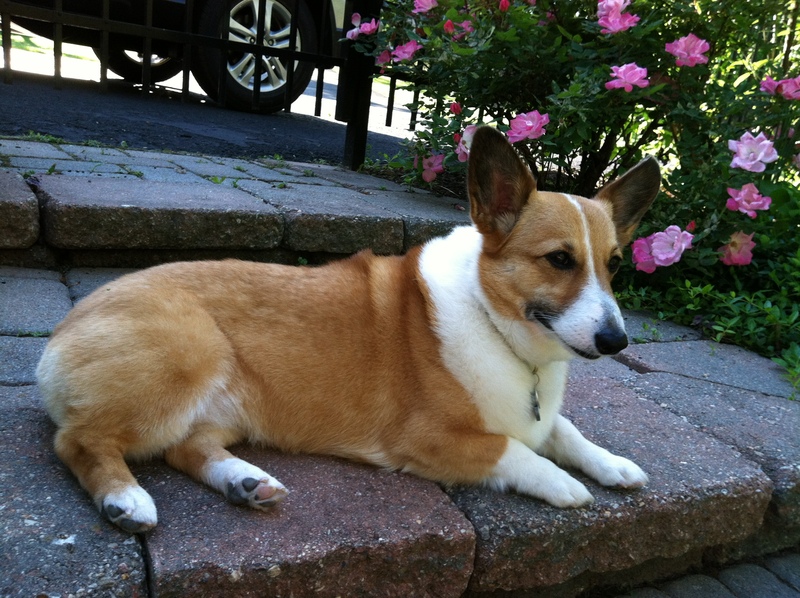 But soon, Butters was allowed out during the afternoon and, soon afterward, she was free all day. 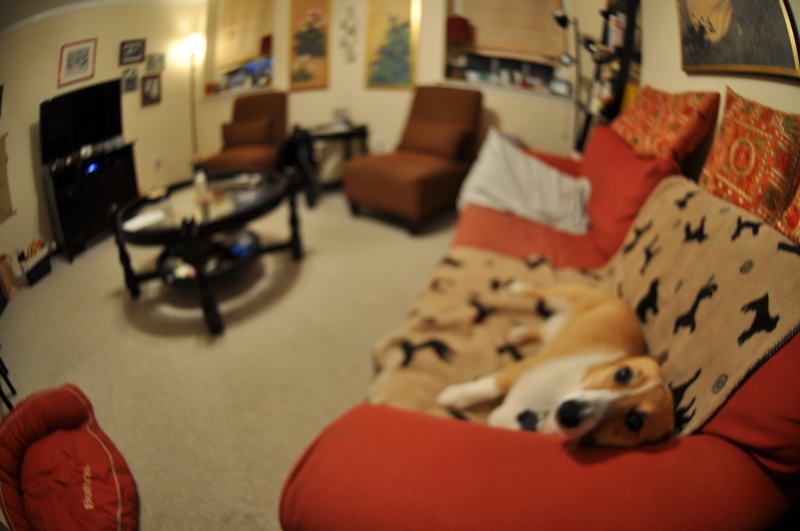 Most of the time, Butters would move from spot to spot in the living room and nap. Every once in a while, she’d hear a noise outside and she would bark and bark and bark — this was HER house and Mommy’s house, she thought, and everyone else must beware! Sometimes, she would pull all of her toys — and there were a lot of them! — out of her toy basket and when Mommy got home, they’d be strewn about the floor. Mommy didn’t seem to mind, though. She would just smile at Butters, pat her on the head and put them back in the toy basket so Butters could play with them again later. 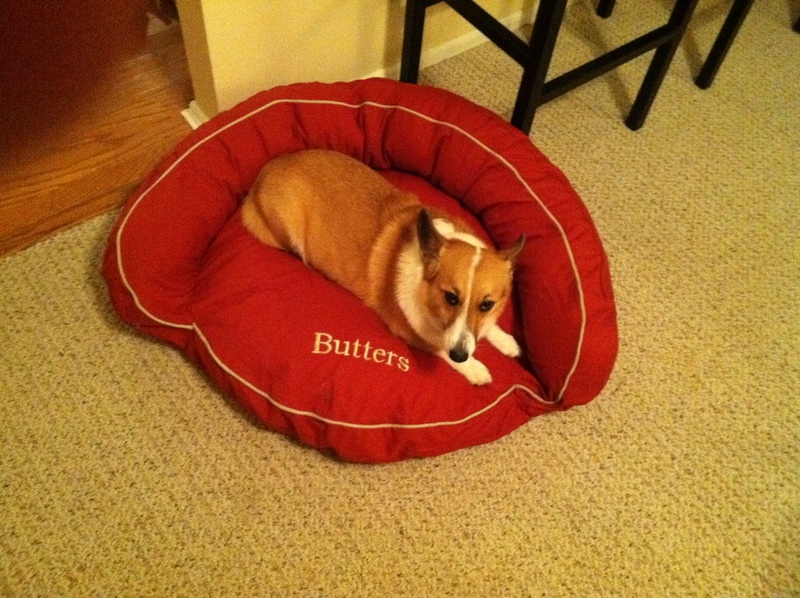 Butters’ castle had a bed with her name on it — it matched Mommy’s couch, although Butters also liked to sit on the couch with Mommy. Mommy put a blanket on the couch for Butters, and Butters loved to jump up and snuggle with Mommy. this is MY bed and no one else’s! 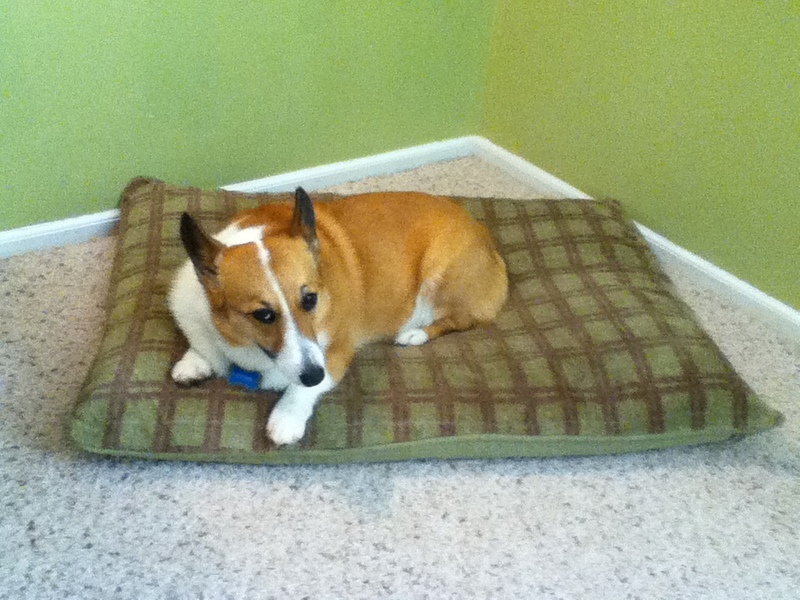 Butters also had another bed, in Mommy’s room — it was green and matched the bedroom. Mommy liked for Butters’ things to match her things, and Butters liked matching with Mommy. Most of the time, all was calm and quiet in the castle. But sometimes, Butters got into a little trouble. Like the time she got up on the kitchen table and ate a bunch of spicy Indian snacks. Or the time she got up on the coffee table and chewed on a book that Mommy’s friend from college wrote. “How do you get into these things,” Mommy asked in amazement and exasperation. One day, Mommy and Grandma could do nothing but laugh when Butters managed to tear into a box of treats that arrived at the castle. Nancy the dogwalker, who Butters loved very much, brought the package upstairs and left it on the floor for Mommy to open when she got home. Butters sniffed the box, and, lo and behold! She smelled something amazing. She smelled TREATS. 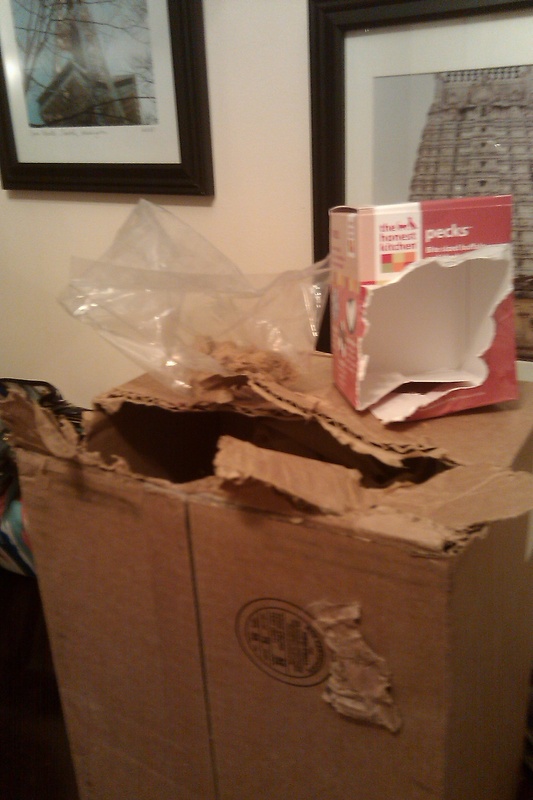 She licked the cardboard and licked and licked and licked until it was soft, and then ripped it open. Inside she found treasure — boxes and boxes of doggie treats, just for her! She ate a whole box of treats before Grandma discovered her and said, “Butters, what did you do? 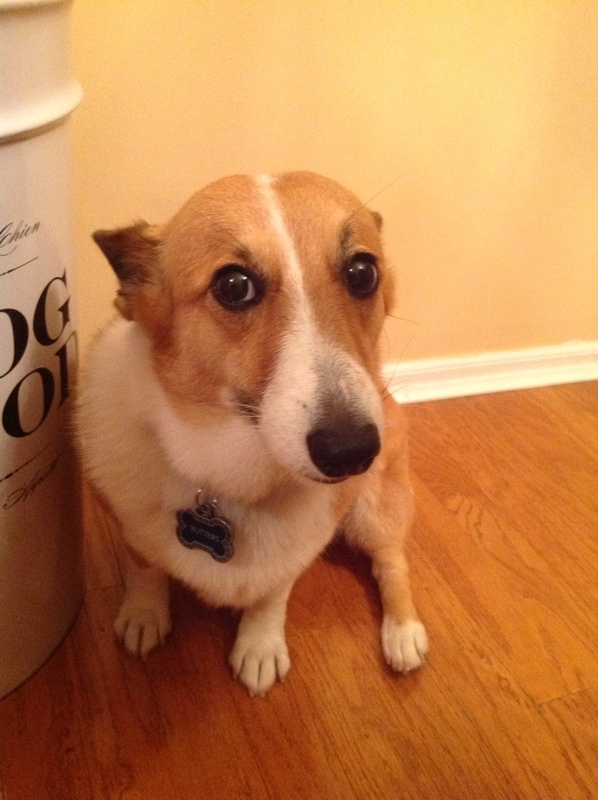 !” Butters’ ears went back and she tried to crouch behind the table. She always tried to hide when she was in trouble, and it never really seemed to work. 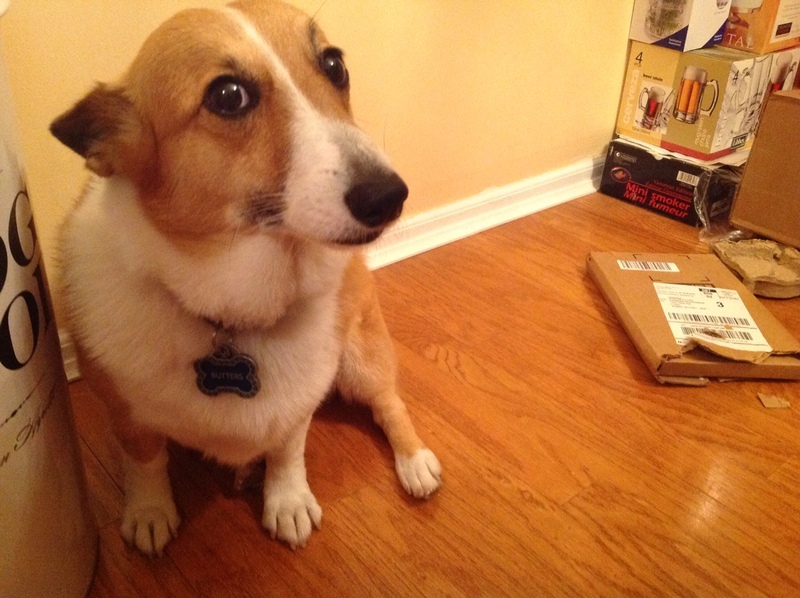 this is the face i make when i’m in trouble …. Butters looked up at Mommy, as if to say, “well, I kind of figured that these treats were for me, and why should I wait to have them?” After all, this was Butters’ castle, and she was the queen of it.